Mix in mashed bananas, beat till combine. I love that these are steamed! These look absolutely delectable! I just want to reach in my computer and swipe one! I will definitely be trying this recipe out! That looks so incredibly moist! I’ll definitely have to try! I’ve added this recipe to the ones on my fridge, hopefully it won’t take me 3 years to make it! this looks sooooo good. it’s like sponge cake meets banana bread. i know some “healthy” baked banana bread uses some apple sauce instead of oil, do you think it’ll work for this steamed version too? How do you steam it though? I mean, obviously not on th e stove. So do you put the muffin tin in water in the oven or something? Rachel: 😀 i’m sure u will love the taste of it too! Steph, Cakewardrobe, nurboetb : yes! u have to try it. These are delicious. Brilynn: *giggle* maybe i should frame this recipe up yea? I tried this recipe and it couldn’t have been easier!!! sooo yummy! i even served mine with a toasted walnut & honey cream cheese! Those look so good! Using steam to cook “baked” goods sounds interesting. why is steamed cakes healthier than baked ones when steamed one uses oil and baked ones uses butter? anyway i really love how your blog is filled with pictures of thigns i love!! (: im definietly going to try some of your recipes! Gillian: I’m glad u like it! 😀 served with walnut and honey cream cheese! GOSH! those are my fav as well! I love all banana recipes, but I am don’t have a steamer. Is it worth getting one? Is there any other way to steam little cakes like these with another contraption? Alternatively u can just put a small bowl in the centre of the wok. Place your muffin tray or pan on top of the bowl. Cover the entire thing with a wok lid, or any large metal lid you’ve got handy. Geez, this looks so appealing to me that I’m going to make it tomorrow morning when I get up! Great blog! Cakebrain: Thanks! 😀 your black sesame pudding reminds me of 9-layer kueh! *drool* i should steam it too! i will try today . can i put any flavour ? i tried this out too~ eating it for breakfast now~ yumS! thanks! Hi, may I know in terms of volume, how many cups is the 2 mashed bananas? Cos’ I used 2 large del monte bananas, and the cake took like 45 mins to cook, and even then was still a little bit wet. (but tastes nice tho’: )). Thanks! hi kellie, i used medium size Asian bananas. not really sure how much will take measure up to in cups, the next time i make these, i will be sure to measure the amount 🙂 let me get back to you on this. maybe u can try using 1 + 1/2 big bananas 1st? 45mins? that’s weird, are u steaming in a cake pan or muffin cups? if u are steaming in a cake pan, the steaming time should be extended and adjusted accordingly. Hope that helps. Hi Mandy, thanks for replying : ). I steamed directly using the mixing bowl..lazy me : p. Will try steaming using muffin cups next time. Looking forward to you posting your steamed pandan cake recipe soon ; ). I have tried your steam banana cake yesterday afternoon. It turns out very good. I substitute melted butter instead of oil. I use 4 medium ripe bananas and the cake was so delicious and full with the bananas aroma. Thanks for sharing the recipe. Looking forward for more recipes. Hi!! I tried this recipe and it was great!! Kellie: I have made these again yesterday! 😛 and this time, i measured the bananas… you should be using around 200g of mashed bananas. 🙂 wish u success in making these! Hi, I found this recipe when I was googling for a steamed banana cake recipe. I tried it with a few modifications – no sugar, no added water, wholemeal bread flour, butter & 1.5 teaspoons baking soda. it was absolutely delicious & tasted like a baked banana cake! Thanks! 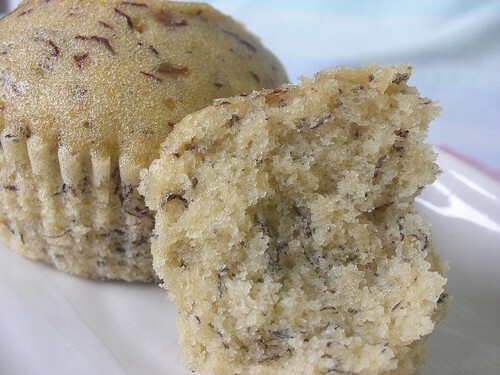 hello, has tried your steam banana cupcake, but err..when it was steaming, it was puffing up, but once out of the steamer it shrink…not so nice like urs :(( any idea what could be the reason? i didnt use the muffin tray, bcos it is not able to fit into the steamer. i use the chwee kueh cup and line it with muffin cup..
but the cake was nice =) thanks!! Thanks for sharing the recipe. Will definately try it out.Many tks ……..
Chinggaisky and FeelIn: Thanks for the kind comments! 🙂 yes, do try it out.. one of my fav recipes. Can I make this into mini muffins? If yes, how long do I have to bake them? Thank you! I’m planning to make a large batch of this for a friend’s birthday! Can you tell me what do you mean by beat till ribbon stage? I don’t know what this means. Is it till creamy and fluffy? hihi Pamela, when ribbon stage is achieved, u will be able to leave a trail( write an “8” ) with your whisk or spoon. it will be visible for a short while before merging back into the mixture. I made this twice, once into mini muffins and once into medium muffins. Both steaming time was 7mins and 15mins respectively. Thanks! how would i make this in a 9×7 silicone pan? fullofwonder, yes, most certainly u can. 🙂 i made them into muffin size for easy consumption. Heys! This looks like an easy recipe. Could you state the measurements in cups / tbsps though as I do not have a weighing machine. Thanks! This looks nice and easy. TQ for sharing the recipe. Why i took an hour to steam the cake? hi, can i ask if the 200g bananas is weighed with the skin on or already mashed? can i use the electric whisk to whisk the egg and sugar together? will it affect the steamed cake? and how long does it take for it to reach the ribbon stage? i have tried to make this, it is fantastic!!..superb! Thanks for your lovely recipe. I followed exactly but was unable to get the cake to crack like a flower despite adding another 1 tsp baking powder? Kindly let me know what went wrong, thanks. HI if i use olive oil, can be done? I just tried this out; but I always seem to have a problem with steamed cakes. Any advice especially on the flattening? Hi Thanks for the recipe.i think the bananas i use is not ripe enough so not that sweet n fragrant. Any particular banana i should use? Also how long should i whisk the egg n sugar? How do i prevent the air deflating when mixing with flour?When i finish mixing i notice the batter deflated to half already.Is it because of this my muffin doesnt rise like yours? Thank you! Hi, just wondering would it affect the taste if I omit the baking soda? Your banana cake looked so yummy! soft & moist! However, I tried making them but failed. No matter how hard I whisk the eggs and sugar together, it still won’t reach the ribbon stage. It’s just like the normal beaten eggs. Do you whisk by hand or a mixer? Please advice as I really want to try this out. Thank you so much. i live in a tiny room in paris, which has no kitchen, but i have sneakily bought a steamer, and these work perfectly!! its so wonderful to have a cake that i can make in here, so easily!!! i love it!! i call them my fluffy little banana happy cakes!! Thanks so much!! I just make this cake and it taste so good and yummy, !! Thank you for sharing this lovely recipe.!! 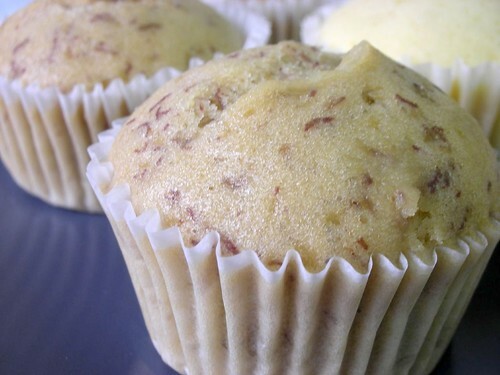 Thanks for sharing your banana muffin recipe! I tried and the muffin taste good. Can i put in more bananas? Eg, instead of 2 banana, i put in 4 bananas? If yes, do i need to adjust other ingredients like flour etc? Thank you for sharing the recipe! 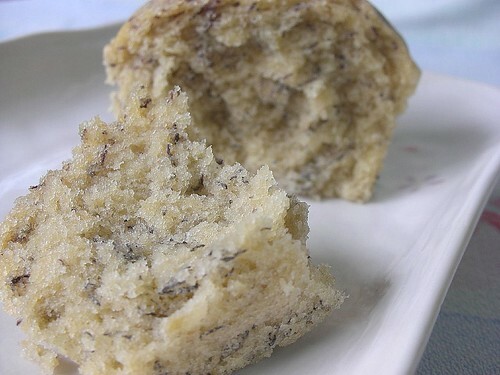 I have just make this steamed banana cake. It took much longer cooking time as i used a pudding basin instead of muffin cups. The result was light and fluffy, exactly what i was i hoping for. I was very pleased to find this web-site.I wanted to say thanks for your time and for this wonderful read!! I definitely enjoy every little bit of it and I have you bookmarked to check out new stuff you blog about. hey i tried this recipe, it looks great but tasted so weird!!! the flour taste abit too overwhelming and i don’t know why it’s just so smelly. but i followed the measurement yet i think that the floor is a little too much or idon’t know what’s wrong. it’s a little toooooo soft. hey i already tried your recipe and i added some raisins above it. Tried it out and it’s rlly good!! Substituted the self raising flour w top flour and I’ve added in chocolate rice. Rlly yummy and healthier alternative to baked banana cake! Thank You for this recipe!I made a slightly chunky version. Check out mine! I made for my family love it. Check out mine!! Tks for sharing d recipe. I just tried it out yesterday n its fluffy n nice. Love it so much. Hi Baker Lee! Thanks sooOOOooo much for the recipe. I just made it..and it the cake taste good! It’s a big deal for me (I know sound silly)…since this is the 1st time that I attempt to make a cake. I steam in a wok for 20 mins but when I poke the middle it still sticks on the chopstick. So I steamed another 5 mins and the outcome is still the same. Should it be as such? first time steam a cake. What do you mean by whisk together Eggs and sugar till ribbon stage? What is ribbon stage? minimal disruption to add a fresh twist for wooing homebuyers. Good home audio cables can make perfection in sound. themselves the best they’re able to. Please measure the sugar, flour and oil in terms of cups or tbsps.? knew off any widgets I could add to my blog that automatically tweet my newrst twiter updates. reading your blg and I look forward tto your new updates. You recognize therefore considerably when it comes to this subject, produced me personally consider it from numerous various angles. Oh good! Even no oven can be steam. I try this next time. Hi Amanda, i have been trying out various cake recipes but always with little success. Today i chanced upon your steam muffin recipe and decided to give out a try and it was a great success! I used cake flour plus baking powder as i do not have self raising flour. I also used a hand whisk as i do not have an electric one. But it still works! The muffins were soft and fluffy. As i had some more bananas left, i cut them into pieces and top up the muffins before steaming so the muffins were really sweet with the nice fragrance of the bananas. Thanks for sharing the recipe and I’ll be sure to try out more of your recipes from now on! This is really good. I just make and it so delicious. Simple easy no mess and very tasty. Add a little orange juice and chopped walnuts. Hi, can I use all purpose flour instead of self raising flour? How many teaspoon of baking powder needed?